This is a true story. Now dear readers, bear with me on this - it is a little racy, but too amazing not to recount. 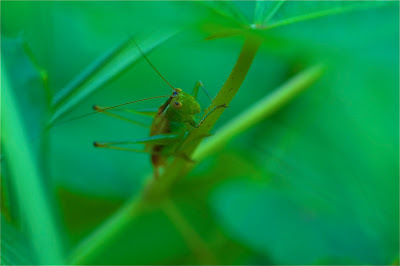 I was back in the marsh along the pond at Eastern College this afternoon trying out my fancy new 200 mm macro bug lens. As I was walking, I heard a little rustle in the grass. I spotted a nice sized grasshopper who had just hopped onto a stalk of grass. 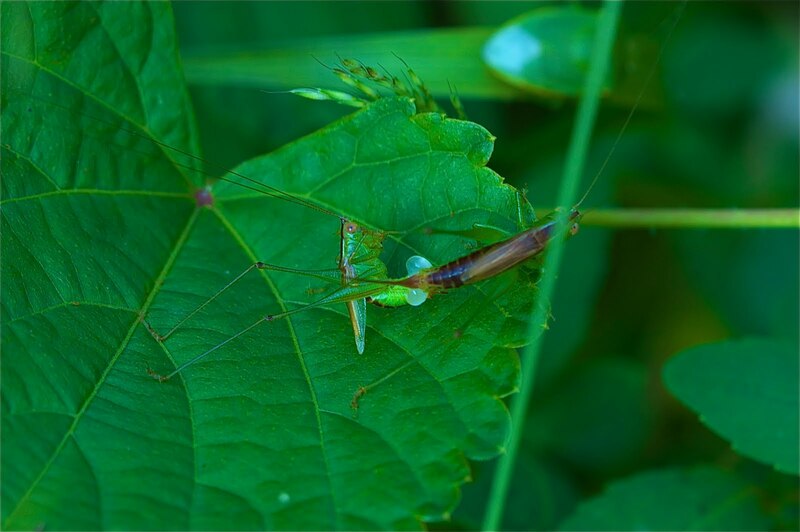 I adjusted my tripod, so I could get down on my knees to his level and take a few pictures, but there were a lot of weeds in my way. As I looked through the view finder I noticed the grasshopper had hopped off the grass. Darn.... 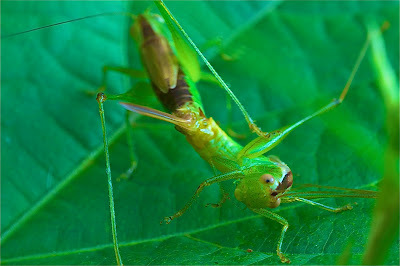 But then I looked a little to my right and there on a large leaf was the same grasshopper. The leaf was a perfect stage for a good portrait shot. 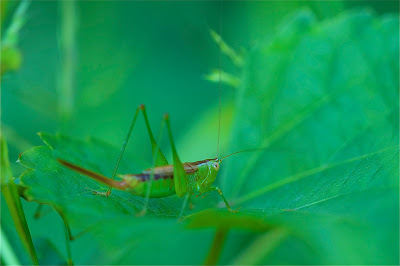 As I adjusted my lens, lo and behold I see another grasshopper has joined the first one on the stage. Oh my... so nice to get two grasshoppers in one shot. 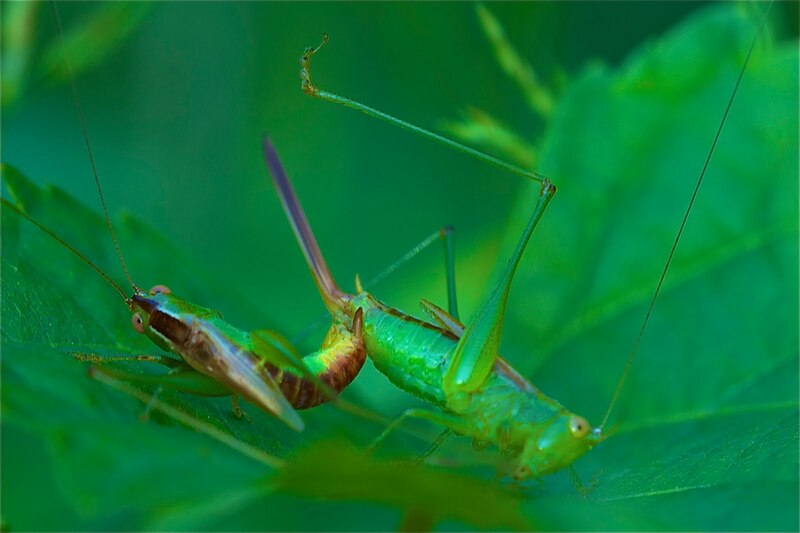 Then I notice the first grasshopper is leaning over on his side and the second grass hopper is approaching him and leaning over on her side. 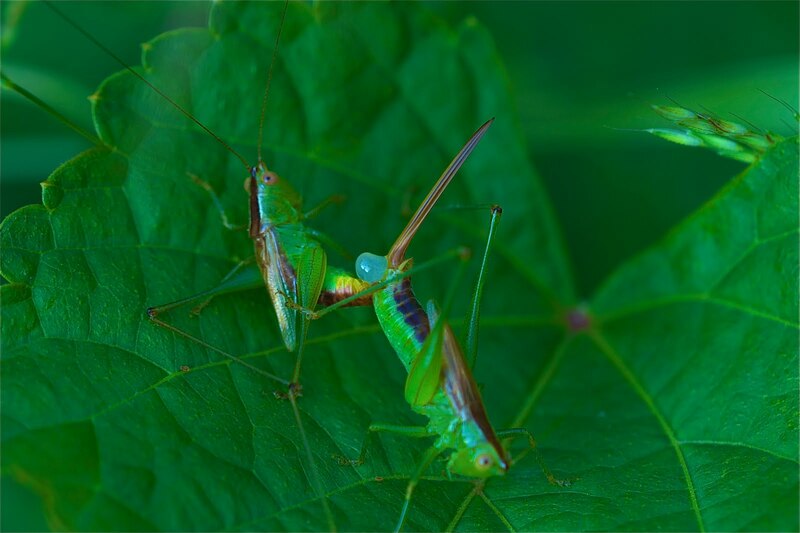 And before you know it the two grasshoppers are laying down on the leaf doing what all good grass hoppers do. Well, I had a field day trying to find the right angle to capture this bit of mother nature in the making. As I was clicking away I noticed a big bubble beginning to form where these guys were joined. Who knows what the heck that was. 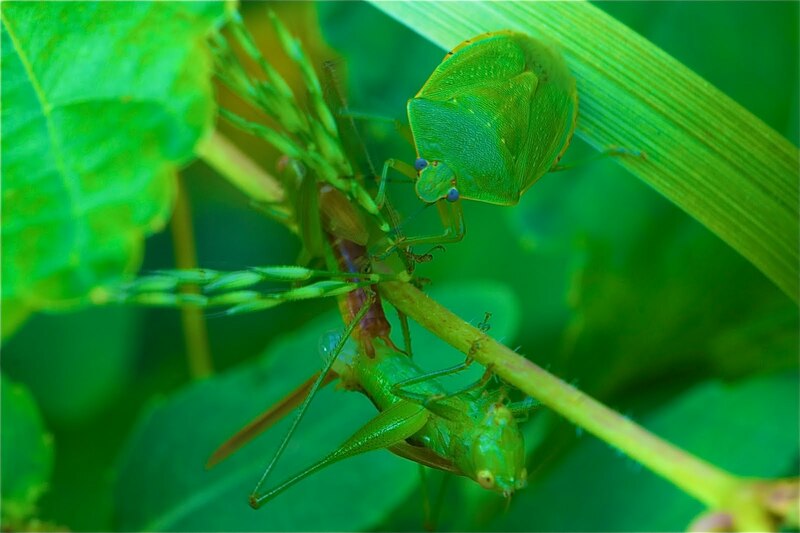 I am clicking away, when I notice from the corner of my eye, a large green stink bug with blue eyes approaching on another leaf near by. 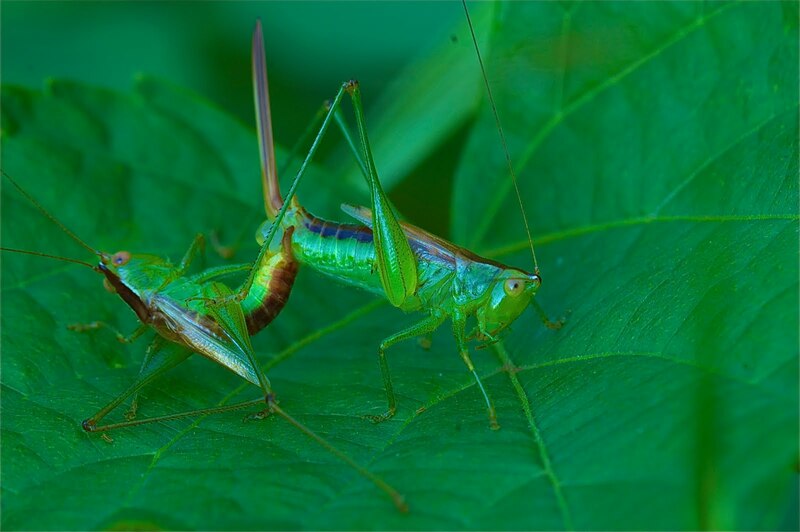 This then prompted the boy grasshopper to drag the girl grasshopper off their leaf and into a more private area. The stink bug just kept approaching and was now on a higher stalk peering over the two attached grasshoppers. I was in a tizzy trying to get the right angle and not get too close to scare anybody away and also trying to get everybody in focus. NOT AN EASY TASK. 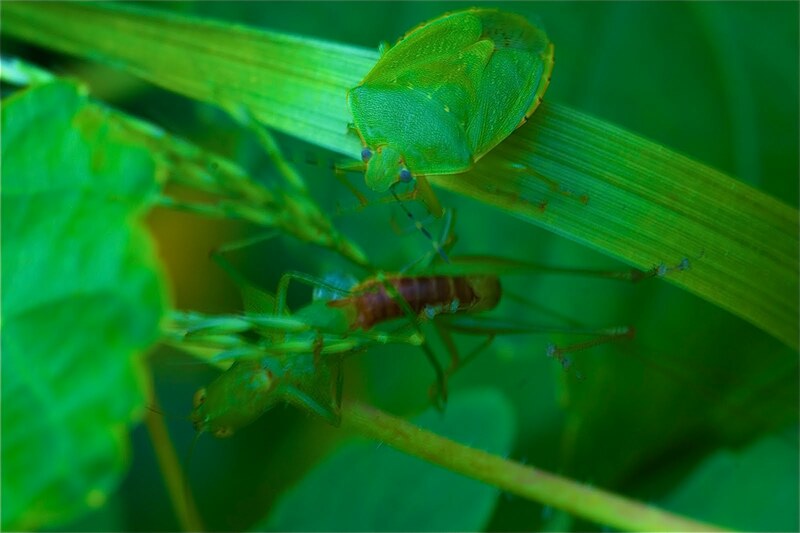 And then as I looked through my viewfinder, I see the stink bug put his little hands out and touches the two joined grasshoppers as if he is blessing their union. I mean to tell ya, it's a beautiful jungle out there!!! Click on the photos to see all the action and the bubbles and the stinkbug blessing.